Trip hoppin’ in Bristol – a glance at the city’s best bits! Home → City Guides → Trip hoppin’ in Bristol – a glance at the city’s best bits! The vibrant and multicultural city of Bristol, located in the west of England and close to the border with Wales, is a treat to visit. Whether it is through their approach music, cuisine or lifestyle, Bristolians are incredibly open minded and fun loving and you’ll find the city packed with interesting things to see and do. Bristol really came into its own during the 1990s when the city became the ‘trip hop’ capital of the UK. ‘Trip hop‘, which blends electronic music with soulful beats and vocals has come to define the city’s laid back atmosphere and rich cultural tradition. 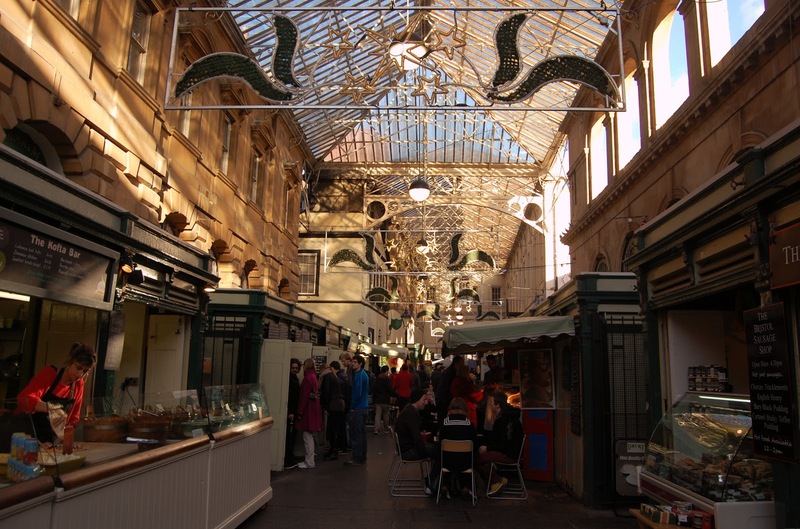 Keep on reading to find out what we enjoy doing most when visiting Bristol. It’s a city where diversity is celebrated and people of different ethnicities and cultures come together in harmony. Anyone visiting Bristol should check out See No Evil, a huge outdoor art exhibition that has spruced up a formerly a dull thoroughfare connecting the Broadmead Shopping Centre with central Bristol. 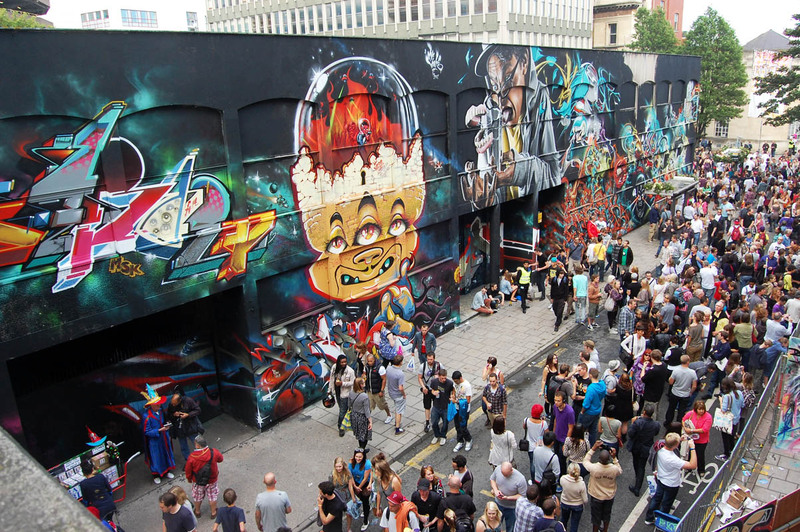 In 2012, graffiti artists from around the world were asked to contribute to the art project ‘See No Evil’ on Nelson Street which is the UK’s largest street art project. Huge works of art dominate every available wall – this is definitely one of Bristol’s must-see attractions! Bristol has had a long and not always comfortable relationship with graffiti and this exhibition is a good example of the city’s acceptance of graffiti as an art form. Bristol is where world famous graffiti artist Banksy grew up, whose often subversive and controversial work around the cityscape was initially vilified and later celebrated by Bristol’s local government. Bristol is a hugely diverse city with nearly a fifth of the city’s population from ethnic minority background. The cuisine and eating traditions that these minorities have are amongst the many fantastic contributions these different communities bring to the city! One of the best places to sample some of this is at St Nicholas Market, located on Corn Street. Here you’ll find a brilliant selection of ethnic food. Our favourite place is Al Bab Mansour – a decadent Moroccan cafe that serves gorgeous tagines, meatballs and cups of traditional Berber tea. There’s always a queue – which must be a good sign – but don’t let this put you off! This is the best place to get lunch in Bristol and the prices are very reasonable. You’ll get to experience a small piece of Morocco in the heart of Bristol! Enjoy the fruity aromas wafting from the open plan kitchen, sink yourself into one of the deep seats and relax! Bristol is at the heart of the West Country, an area of England famed for its rolling hills and many orchards. Over the centuries local people have made good use of these orchards and have produced some of the greatest apple cider in the world. Tucked away on a small side street in Bristol’s affluent Clifton area, the Coronation Tap (or Cori Tap as locals affectionately call it) is one of the city’s best ciderhouses and is a fantastic place to spend a few hours in the evening. The Cori Tap has it’s own cider ‘Exhibition’ that is brewed exclusively for the bar! Cider from Bristol and the surrounding area is superb! The cider is served in small glasses from big oak barrels and the bar often features live jazz and blues! 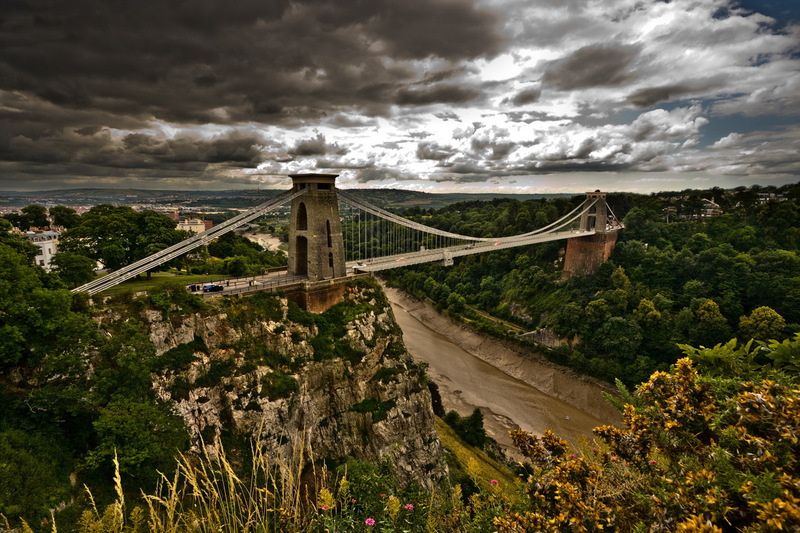 It’s located around the corner from the magnificent Clifton Suspension Bridge, designed by Isambard Kingdom Brunel. It’s worth spending an evening in the Clifton area – it’s nice to walk around the leafy streets lined with old buildings or stroll through the huge Clifton Downs park. Shopping in Stokes Croft. Photo via Bristol Street Art. Stokes Croft is Bristol’s most interesting area to visit. 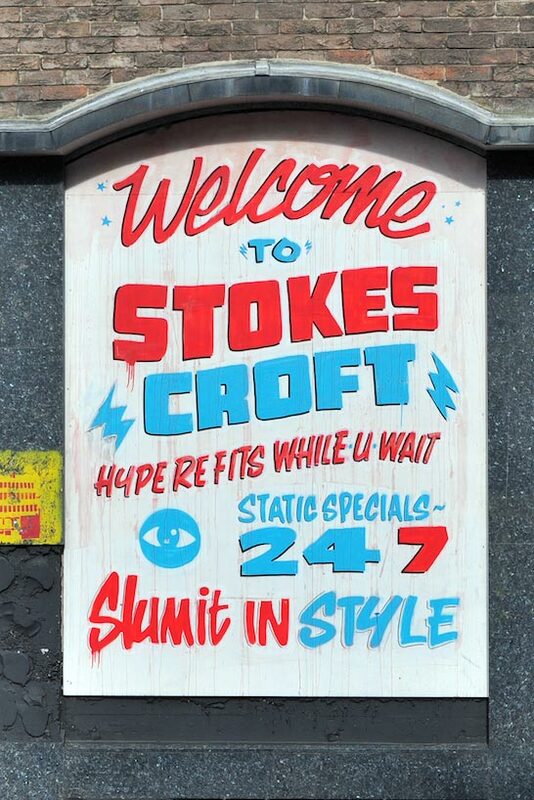 Located along Cheltenham Road, Stokes Croft has an amazing selection of cool bars, vintage clothes shops, vegan cafes and underground music venues. The area within walking distance of the centre, you’ll find it just north of the city centre’s large St James Barton roundabout. Stokes Croft is Bristol’s bohemian neighbourhood and the main road has the largest density of independent shops in the UK. Beautiful murals adorn the many derelict buildings around Stokes Croft and the people of this neighbourhood have done their best to bring colour and light to what was a fairly run down part of the city. It has undergone plenty of changes in recent years and many students have now moved into the area. The spirit of Stokes Croft lives on however and you’ll find many interesting people packing out the local cafes and bars along Cheltenham Road. We love visiting the not-for-profit Cube Cinema which hosts a diverse and often obscure selection of film nights and musical performances. We particularly enjoy the Hell Fire Video Club that is held monthly on Fridays. There are many eating and drinking options in Stokes Croft – try the Prince of Wales pub for great food, tasty pints and pub quizzes. The Grecian Kebab House situated just around the corner serves good takeaway pizzas and traditional Turkish kebabs. Enjoy exploring! Bristol’s world famous Clifton Suspension Bridge. Photo via Nahodsa Blog. We hope you’ve enjoyed learning a thing or two about Bristol and it’s unique vibe! Let us know of your favourite parts of Bristol in the comments. Check out our blog on Athens if you’re hungry for more Best Kept Secrets!